Bootlace is an application that can be downloaded on your iOS device. It is used to install OpeniBoot and android based operating system iDroid. You can set and configure OpeniBoot and iDroid using Bootlace and run android operating system on your iPhone/iPod. Bootlace is programmed in Cocoa Touch and with an internet connection you can easily use it on your iOS device. Here is a quick guide on how to install bootlace in iOS and how to run android on iPhone using it. Read - Best Cydia sources for movie box. First of all do remember that Bootlace is an iOS application programmed to run only on rooted operating systems. That is your iOS device must be jailbroken to install bootlace. 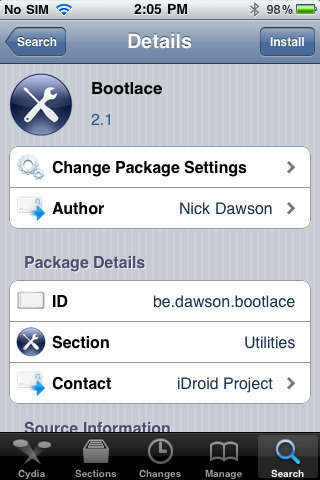 So first jailbreak your iPhone/iPod and download Cydia to install bootlace and convert it into android operating system. If you have already jailbroken your iOS device and installed Cydia you may proceed further and install bootlace. We will install bootlace using official Neonkoala repo. Read - How to install iFunbox. 1. Tap Cydia icon on your homescreen and open Cydia. 2. Go to "Manage" -> "Sources". 3. Now tap on the "Edit" button at the top right corner. 4. Now it will ask you for Cydia/APT URL. Here enter the URL - "http://repo.neonkoala.co.uk". 5. A warning message will appear. Tap on "Add Anyway" and continue. After completing return to Cydia. Now go to search option and search for "Bootlace". Tap on the Bootlace option to install it. Do check that you install the official version. The author's name would be Nick Dawson. Tap on the install button in the top right corner and install bootlace. 1. Just open bootlace. If you open it for first time it will check the device compatibility and will install Kernel patch on your device. It will ask you to reboot your device after installation. Once rebooted open bootlace again. 2. It will now ask you to install OpeniBoot. OpeniBoot will provide you option to choose between iOS and android. In the same way as Bootcamp for Mac ask you to switch between Window and Mac on your Apple computer. Install OpeniBoot. 3. 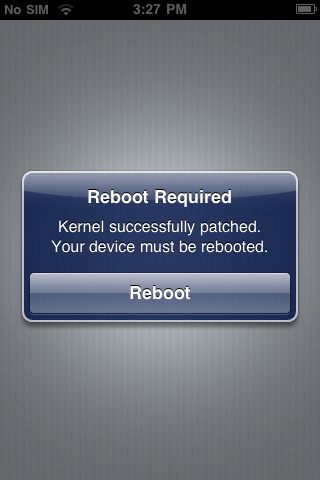 After OpeniBoot is installed you will be redirected to iDroid installation screen. Install iDroid. It may take sometime depending upon your internet connectivity and speed. 4. iDroid is now installed. And a info screen will appear giving you information about your iDroid version, android version and date of installation. A remove button will also appear in case you want to uninstall android version from your iOS device. 5. Now choose the "Quick Boot" option at the bottom and reboot your device. It will show a warning message whether or not you are sure to install iDroid on your iOS device. Select "Yes" and reboot. 6. After reboot android lockscreen will appear on your iPhone/iPod screen. Read - Cydia lockscreen tweaks for iPhone. So this was a short tutorial about how to install bootlace on your iOS device and use it to run on iPhone. Just install bootlace and proceed with some simple steps to get benefits of android on your iPhone.